One of my twins cannot go outside without those pesky little flying annoyances bothering him. It has been like this his entire life. 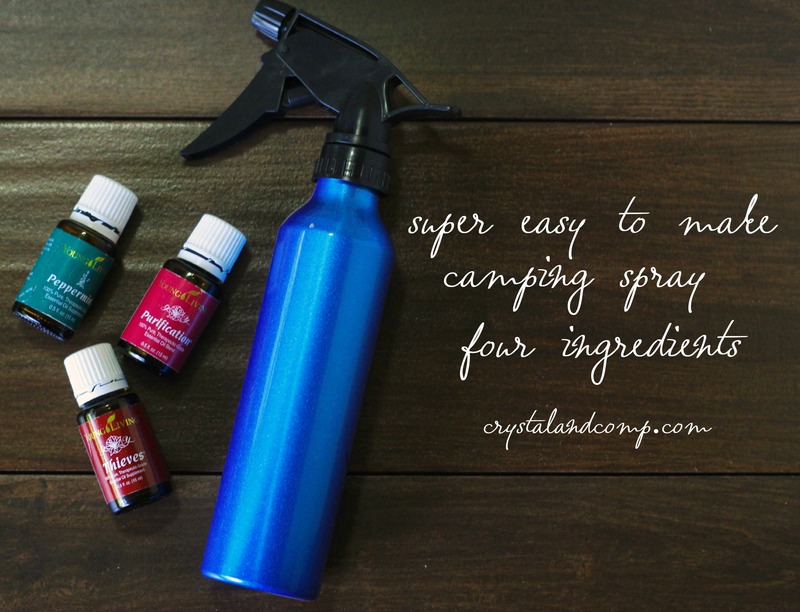 This camping spray is perfect for him and anyone else struggling this summer. You can use it anytime you’re outside… not just when camping. Let me show you how easy it is to make (just four ingredients). 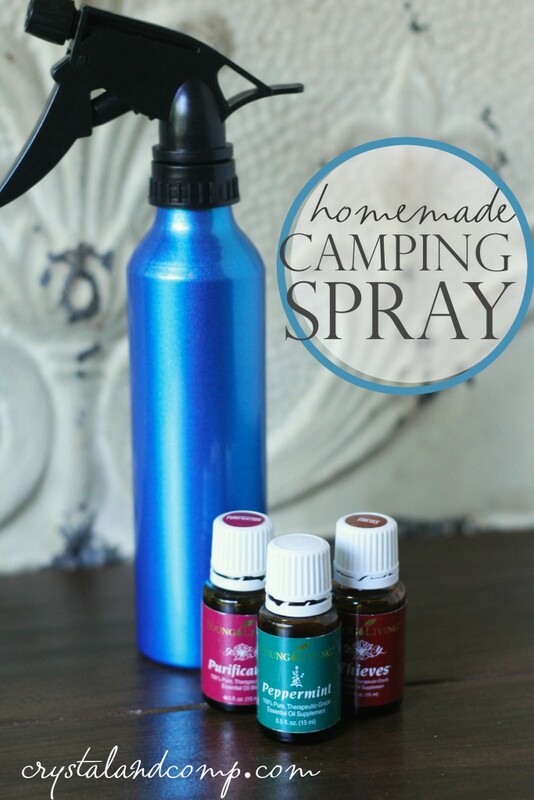 This is another great way to use essential oils. 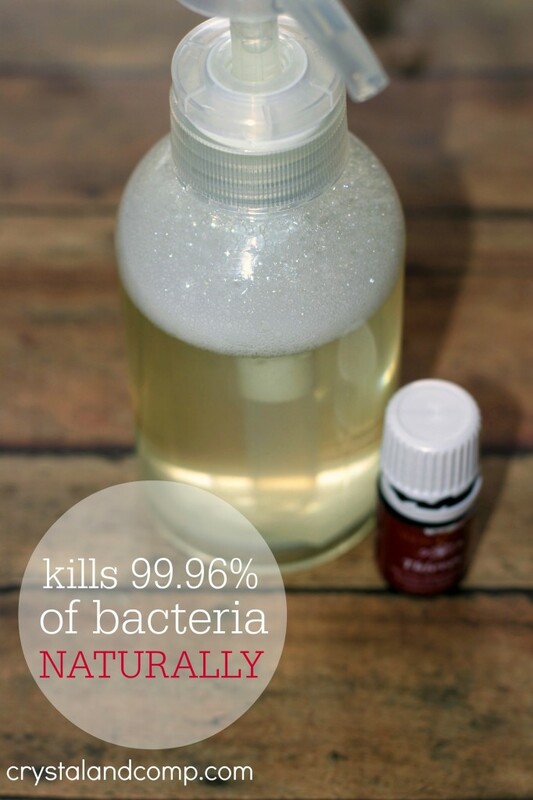 Pour the witch hazel into a clean bottle. One at a time add each of the essential oils. Once done, screw the sprayer lid on the spray bottle and you’re ready to go. I spray this on all of the exposed skin and on their clothes. Don’t forget to spray their backs too! Want to know something cool? Each of these three oils are in the new Premium Starter Kit from Young Living! I love all three of these oils and they each have so many uses! 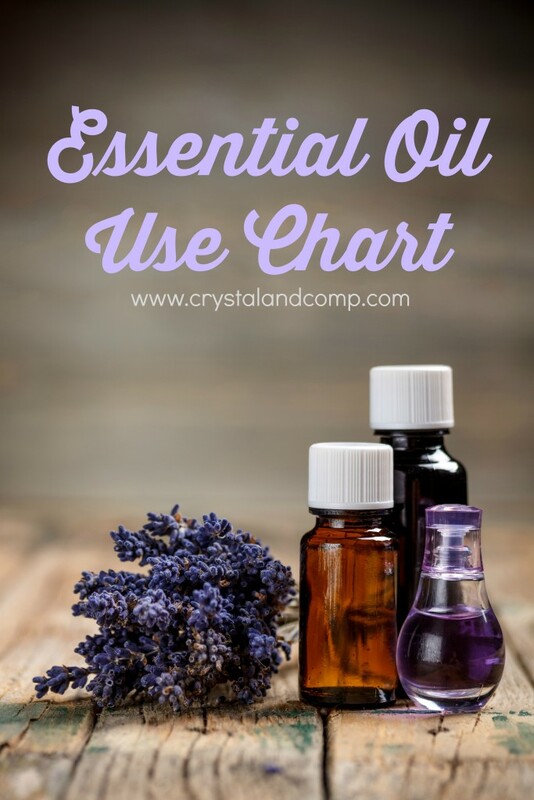 While you’re here, read more about where I buy my essential oils online and I get them for 24% off! Also, remember, not all essential oils are created equal. 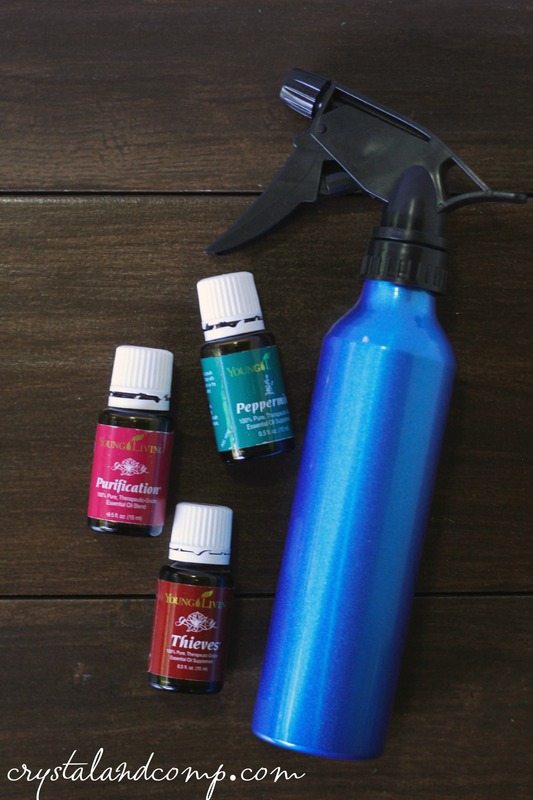 A DIY hand soap you can create with Thieves essential oil blend. 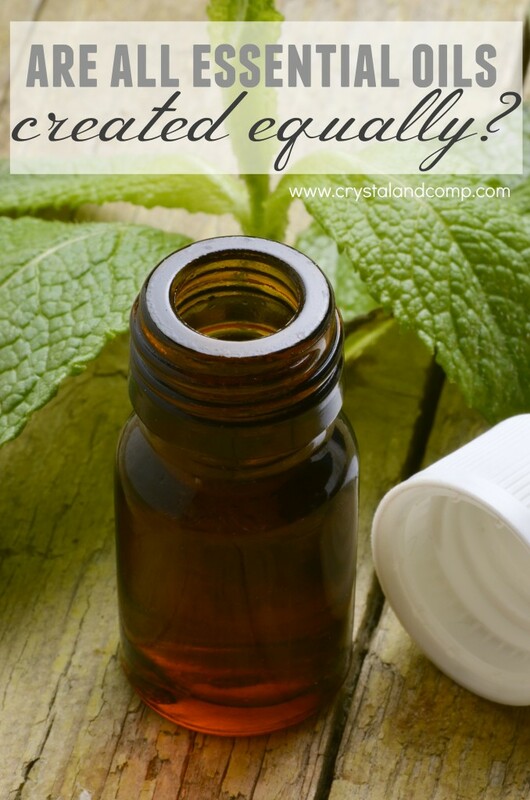 Wondering what else you can do with peppermint oil? 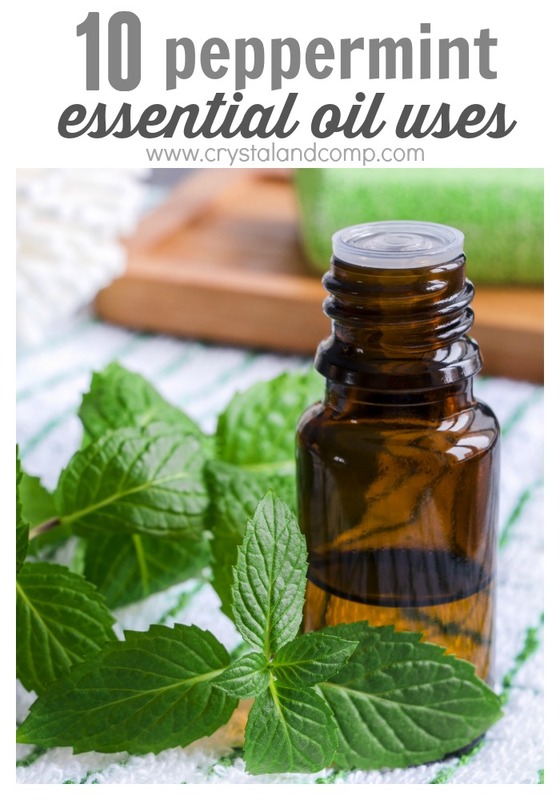 Here are 10 ways to use peppermint oil. I love my YLEO! I have all three of these right now, and I should make this. The bugs are terrible here where we live, and this is definitely a better choice over OFF bug spray. Perhaps I missed it, but where can I find one of those aluminum spray bottles? My friend grabbed these at Dollar Tree. You can also get them on Amazon. This is so easy to make and we love it! Enjoy! My tiny man is allergic to mosquito bites. I use Young Living’s Cedarwood, Tea Tree, and another one that I can’t remember 🙁 to combat the little pests. Works like a charm! When I forget to spray him and he does get a bite, I use tea tree, lavender, and frankincense to soothe them. I love YL oils! I would love to know what the third oil is you put in yours. Huge fan of tea tree oil here! I will have to try tea tree, lavender and frank on any bites we get. I’ve used Purification on bites and it works well. Girl, you may have become my new best friend! I am in love with my YLEO but I only have used them in a diffuser. This is going to be my first “recipe.” I am so prone to getting bit, I hope this is the answer! This is fantastic Crystal. I suffer from being a target for all the bugs in summer and I’d much rather use a natural solution. Thanks so much for sharing at Thriving on Thursdays. I’ll be featuring this one at tomorrow’s party. Thanks so much for joining us. Anything that will help to keep the pesty little bugs away is good in my book. Thanks for linking up to Saturday Sparks. You have been featured today. I think you will really like this. And, I think it smells great!